Is there a command to switch between custom huds (if I have like 2 custom hud folders within my custom folder)? Is it at all possible to use a hud crosshair with one weapon, but not with another? I use broesel's crosshair switcher to have a green cross for my rocket launcher, and a yellow dot for my shotgun. I use a hud crosshair to get a light grey ring around my crosshair that flashes pink when I hit something. I want the grey ring there for my rocket launcher, but not there for my shotgun. I thought maybe this was not possible since it is a hud element, but then I thought that since it changes colors when I hit something, could I possibly just get it to become transparent when I press my shotgun key? TwitchIs it at all possible to use a hud crosshair with one weapon, but not with another? long story short you can switch between two hud crosshairs at will (on a weapon-to-weapon basis) and have another thats on for some classes and off for other classes. [quote=Twitch]Is it at all possible to use a hud crosshair with one weapon, but not with another? Oh god, i'm dumb. Thanks, omni. so I figured out the command for having the server map time left shown without pressing tab. I was wondering if I could change the font and its size/placement, etc. If so, where do I change it? NoFapMy HP turns green while buffed, but doesn't become white after buff expires. How do i fix it? Remove "target" from the last line of that quote. Should be PlayerStatusHealthValue, not PlayerStatusHealthValueTarget. omniIn resource/clientscheme.res, is "BackpackItemBorder" and it's subsidiaries using a custom vtf? Yeah, thanks a bunch, that seemed to be the issue for the backpack panels which is now fixed, however the issue persists whenever I mouse-over an item. Sorry if this sort of post doesn't really belong here, but I can't figure out what this thing is called or how to get it. If it is possible how and can I make this possible. the code is like this. anyway I'm trying to make it up and I'm trying everything but I can't do anything. Move all the other elements in that file instead. Check the xpos positioning of the chargemeter as well. It may be getting cut off by the hudlayout.res width. 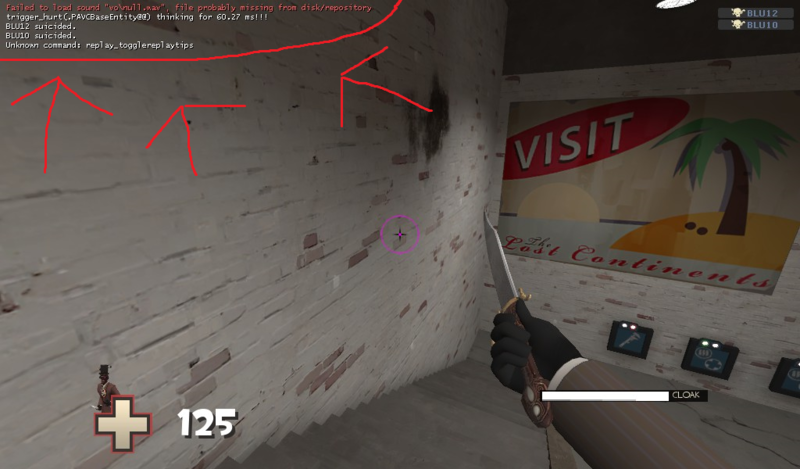 slicrickgamingso I figured out the command for having the server map time left shown without pressing tab. I was wondering if I could change the font and its size/placement, etc. If so, where do I change it? hudobjectivetimepanel.res, under "ServerTimeLimitLabel" and "ServerTimeLimitLabelBG"
Where can I edit the killfeed? >w> I need to learn more before down a full on hud for a contest. anyway.... how would I make a colour for e.g. white, transparent. lets say I have this. How'd I make each one of those white colours transparent? The last number is the opacity. So change the last 255 to something lower. So another problem. I've tried messing around but I only want the background of the killfeed to go transparent but the whole bunch of the colours do. How can I fix this? "LocalBackgroundColor"	"255 255 255 50"	[$WIN32] <--- That one. MubbySo another problem. I've tried messing around but I only want the background of the killfeed to go transparent but the whole bunch of the colours do. How can I fix this? You don't need that really. [quote=Mubby]So another problem. I've tried messing around but I only want the background of the killfeed to go transparent but the whole bunch of the colours do. How can I fix this? before I change 255 to 50. Mubbybefore I change 255 to 50. Take a screenshot of what it looks like when you change the opacity to "0"
[quote=Mubby]before I change 255 to 50.
omni Mubbybefore I change 255 to 50. Hmm, I just had a go of it now. and I think this was me being stupid. The colours of everything else is fine. I think it was just what I had the other colours be. [quote=omni][quote=Mubby]before I change 255 to 50. Sadly thoe I have no idea. Is there a way to make the killfeed leftaligned instead of rightaligned? So I started to really like m0rehud and so I downloaded m0rehud MvM and m0rehud 2.0 and combined them a little. Since I'm not really good with HUDs I need a bit of help. There's a little black box with white borders at the upper left corner I'd like to get rid of but dunno how. It's kinda hard to see, here's a full size pic. Any ideas? I'd like to put the 'class performance posture' here, The stuff the class does when you select it, in like a little gif. Where can I find this and how do I edit it? I'd also like to make a tauntmenu in the style of the hud, but I have no idea which files to edit. Currently when I press G nothing comes up. I've just started out with this and I might add more screenshots/questions later. Thanks for any answers. [*]There's a little black box with white borders at the upper left corner I'd like to get rid of but dunno how. It's kinda hard to see, here's a full [url=http://i.imgur.com/XZu44lI.jpg?1]size pic[/url]. Any ideas? [*] I'd like to put the 'class performance posture' here, The stuff the class does when you select it, in like a little gif. Where can I find this and how do I edit it? [*] I'd also like to make a tauntmenu in the style of the hud, but I have no idea which files to edit. Currently when I press G nothing comes up. Where is the vaccinator icon located in the res files? I need to move it (and resize, if possible) but i'm unsure of where it's located. ALSO, is it possible to make the reserve ammo text be team colored? I know how to change its color, but i'm not sure if there's a way to make it teambased?